A distinctive annual, the leaves and bracts are usually bronze or purplish to dark brown, glossy and very sharply toothed. The plant is generally very dwarf when grazed, but can sometimes become quite a branched, bushy little annual. In the British Isles, Irish eyebright is confined to western Ireland. The headquarters of the species is very definitely in the Burren, County Clare, but it ranges in smaller quantity and discontinuous manner along the western limestones from Counties Limerick to Donegal, including Fermanagh. Irish eyebright, in Northern Ireland, is completely confined to the upland limestones of western Fermanagh. In Ireland, it is locally frequent in grazed limestone grasslands on shallow, dry, limestone soils on rocky ground, cliffs, or on sand-dunes up the west coast. It flowers in mid- to late summer. 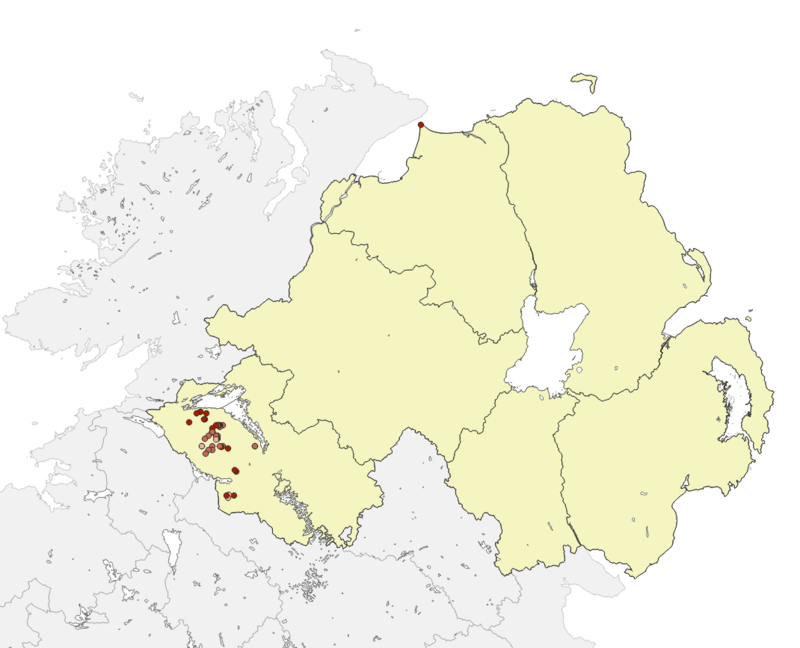 This species is rare and declining, and all of the UK population occurs here in Northern Ireland. It is very closely associated with, and semi-parasitic upon, Wild Thyme, Thymus polytrichus (=T. praecox ) (Webb and Scannell, 1983). Irish specimens differ slightly from those of the Continent and have been distinguished and named as the endemic var. hibernica Pugsley (that is, this form is only found in Ireland). The characters that allow recognition of this rare species are the complete absence of hairs on the upper margin of the heart-shaped fruit capsule, and the narrower leaves than in other Euphrasia species, which are at least one-and-a-half times as long as broad, hairless, and with 2 to 4 long, jagged teeth on each side. Typically the plant is low-growing and the leaves are a deep chocolate brown or purplish-brown and green in colour (Webb et al., 1996). The tiny flowers are white with purple veins, and they appear between June and September. The plant is of very small size, often only 2 to 12cm high. All species of Euphrasia in the British Isles are hemi- or semi-parasitic annuals, that is, they are attached and partially dependent upon the roots of host plants of a different species for some of their nutrients. In most cases they occur within permanent or semi-permanent grassland communities. Irish eyebright is an indicator species of calcareous or base-rich soil conditions. Germination usually or always occurs in the spring, followed by attachment to the root system of a suitable host plant species, especially or almost exclusively, on common thyme. Availability of suitably open, bare soil for germination sites is likely to vary from year to year, and early season droughts also appear to affect successful germination or host-establishment. Small-flowered Euphrasia species typically self-fertilise as the flower opens (Yeo, 1966), and therefore they form hybrids much less regularly than larger-flowered forms. Even small-flowered species like this one receive visits from hoverflies, the usual pollen transporter of this genus (A.J. Silverside, In: M.J. Wigginton (ed. ), 1999). Irish eyebright is only weakly competitive and consequently, in common with other Euphrasia species in Britain and Ireland, populations generally show marked fluctuations in abundance. Irish eyebright can be determined from other Euphrasia species by the complete absence of hairs on the upper margin of the heart-shaped fruit capsule, and the narrower leaves. It is locally frequent in Fermanagh but very easily overlooked on account of its very small size, often only 2 to 12cm high. It flowers in mid- to late summer. Elsewhere in Ireland, it is much more easily spotted in the Burren, County Clare, where it grows from sea-level on fixed sand-dunes to rocky limestone pastures at higher levels. Relevant access permissions should always be sought prior to visiting any sites. The headquarters of the species is very definitely in the Burren, County Clare, but it ranges in smaller quantity and discontinuous manner along the western limestones from Counties Limerick to Donegal. It is confined in Northern Ireland to shallow, short-turf rocky grassland in the upland limestones of Fermanagh, west of Lough Erne, especially around the Knockmore and Monawilkin ASSIs. The species is much more common in the Alps and the Pyrenees, and it, or a closely related form, also occurs further north in Scandinavia and south-eastwards to Turkey and Crete (Clapham et al., 1987; Grey-Wilson and Blamey, 1995; Hulten and Fries, 1986; Map, 1683). Extreme rarity and isolation of a small population is always a threat in itself to long-term survival of a species, making it more vulnerable to chance environmental damage. Essentially a pasture species, it is sensitive to both excessive grazing pressure which prevents it seeding, and abandonment of grassland management leading to the growth of taller, shading grasses and herbs. Nutrient enrichment or herbicide pollution could also oust the species, either due to increased competition from vigorous rivals or straightforward poisoning. Implementation of the Northern Ireland Habitat Action Plan for Calcareous Grassland and Limestone Pavement. Maintain the number of viable populations of the species. Records of new sites and estimates or counts of the sizes of populations are always valuable. Send information (including photographs, if obtained) to The Botanical Society of the British Isles – c/o of Botany Department, National Museums Northern Ireland, 153 Bangor Road, Cultra, Co. Down, BT18 0EU or to CEDaR, National Museums Northern Ireland, 153 Bangor Road, Cultra, Co. Down, BT18 0EU, Tel: 028 9039 5256, cedar.info [at] nmni.com. Clapham, A.R., Tutin, T.G. and Moore, D.M. (1987). Flora of the British Isles. 3rd edition. Cambridge University Press, Cambridge. Grey-Wilson, C. and Blamey, M. (1995). Alpine Flowers of Britain and Europe. 2nd edition. HarperCollins, London. Hultén, E. and Fries, M. (1986). Atlas of North European Vascular Plants north of the Tropic of Cancer. 3 volumes. Sven Koeltz, Königstein, Federal Republic of Germany. Webb, D.A. and Scannell, M.J.P. (1983). Flora of Connemara and the Burren. Royal Dublin Society and Cambridge University Press, Cambridge. Webb, D.A., Parnell, J. and Doogue, D. (1996). An Irish Flora. 7th revised edition. Dundalgan, Dundalk. Wiggington, M.J. (ed.) (1999). British Red Data Books 1. Vascular Plants. 3rd edition. Joint Nature Conservation Committee, Peterborough. Yeo, P.F. (1966). The breeding relationships of some European Euphrasiae. Watsonia 6: 216-245.